On February 19, 2015, the last day of New York Fashion Week, Art Hearts Fashion bid farewell to the Lincoln Center with a monumental final show at Mercedes-Benz Fashion Week featuring the talent, creative innovation, and design theatrics that have made it iconic. Models wore hand crafted armor in one show, masks in another, and barely anything in the closing show for MT Costello whose grand finale astonished everyone in the room. In the completely full house of the Theatre guests took their seats, thrilled to be a part of this historic show. Mister Triple X opened the show with a sophisticated streetwear line for men and women. Titled “All X in Wonderland”, the collection featured an edgy fairytale collection with royal and wilderness inspired accents. 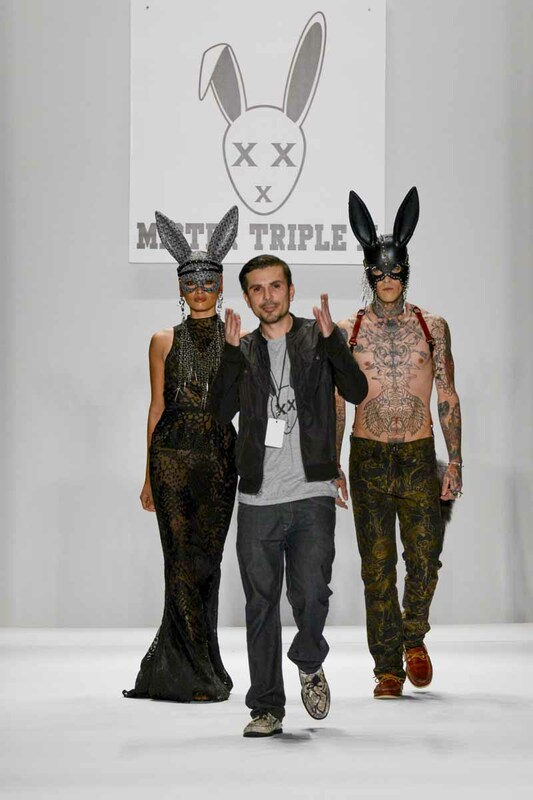 Bold print skirts and dresses stole the show and in the finale walk elicited cheers from the audience as the models wore the Mister Triple X bunny masks. Top Model JimmyQ and Miss Universe Philippines Janine Tugonon walked the finale with designer Erik Rosete in an unforgettable moment on the runway.